What a wonderful end to the Los Angels Master Chorale 16/17 season. The program was almost entirely familiar works, but nothing could have said more about who this group is and where they stand in the musical world. None of the pieces on the program dated to before 1997 and all of them were from composers affiliated with the Chorale – most with strong connections to Los Angeles itself. The occasion was the 20th anniversary of the world premiere of Morten Lauridsen’s Lux Aeterna, a piece completed for the Chorale during his tenure as their composer-in-residence and arguably the work that the LAMC is most identified with. That kind of familiarity with a work gives an ensemble like the LAMC a unique perspective and this past week’s performances of these five a cappella motets were rich, warm, and holy as anything you can think of. Lux Aeterna is both profound and welcoming, and Artistic Director Grant Gershon leads the chorale to really penetrating heights with this piece. The LAMC was wise to use Lux Aeterna as the starting point for programming for the first half of the evening which included works largely commissioned by or for the Chorale with locally affiliated composers, including Billy Childs, Moira Smiley, Shawn Kirchner, Esa-Pekka Salonen and Eric Whitacre. All of the works touched on the same themes of light, gratitude, and time in different ways representing a great cross-section of musical styles. Perhaps the most pointed and poignant contrast to Lauridsen’s masterpiece was the opening Iri da iri, a setting of the concluding stanza of Dante’s Paradiso, which the choristers of the LAMC commissioned directly from Los Angeles Philharmonic’s Conductor Laureate Esa-Pekka Salonen. It was as haunting now as it was at its 2014 premiere. Salonen’s mystery of the spheres is as equally full of mystery as Lauridsen’s, but where Lux Aeterna is bright and inviting, Iri da iri is dark and foreboding. It’s a universe that is awe-inspiring but may not always be a friendly one even with salvation possible in its vast folds. Perhaps the other breath-taking moment of the night stood immediately half-way in between these works. 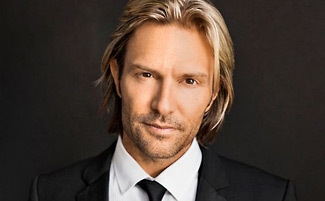 Eric Whitacre’s I Fall received its West Coast Premiere with the LAMC’s Artist-in-residence conducting his own work. The piece is just a snippet of a larger work Whitacre is developing with his long-time collaborator, poet Charles Anthony Silvestri. In this instance the darkness and light of salvation take a far more personal and immediate turn. Silvestri has set the most personal and cutting of subjects in this excerpt – the moment of his wife’s passing nearly a decade ago from cancer. It’s one of those moments that feels beyond any sort of analysis or reproach given the depth and extreme intimacy of its subject matter. But to be certain, this collaboration was a stunner. A moment where gratitude and loss and failure all meld into one dizzying mix. Whitacre is a choral superstar for a reason, and his masterly work, which slides up and down in tone almost imperceptibly at times was a winning moment. It couldn’t have been a better show for looking back and taking in what’s gone before.